One of my not so favorite things about fall, is the influx of spiders into the house. The younger girls, think their webs are beautiful. I'm not so sure about that, but I do have to admit, the now-you-see-it-now-you-don't quality of the silky constructions, always makes me think of crayon resist projects. ...and then water colors to make them appear, just like when the sun shines through the windows, revealing all the cobwebs in the corners. We made, and revealed several webs, and found the best results (like in the picture at the top of this post) came with nice, thickly drawn lines. C (age 5), had difficulty drawing her lines thick enough. Large, chunky crayons would probably work best, even for children into 1st grade, for this particular project. With the drought all of the insects have been seeking water in houses. I got scared out of my mind when a scorpion was in my house. I'm not planning on making a scorpion craft though in response. You're much braver than I. This looks like such a fun craft. We've been finding webs all over our porch, and Selena's swing set. What an interesting idea! 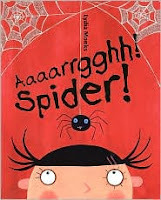 I admit that I am an arachnophobe, and spiders have very little chance in my house, but the resist art looks great. Great use of crayon resist! I've been enjoying your ideas. Have just put a link to this which we did earlier in the week, and to your autumn tree, in a post on my blog.